1.All our products are tailor-made with high-quality-brand accessories, pictures are 100% real shooting. 2. Do not wear bathing, swimming or sweating heavily. 3. Avoid direct contact with chemicals like perfume. Aifeer is registered Trademark by ZAISHI, We offer wholehearted service, any questions will be replied within 24 hours and we will try our best to solve your problems. Style: Leaf design. Unisex, suits for both men and women, pierced and non-pierced ears. 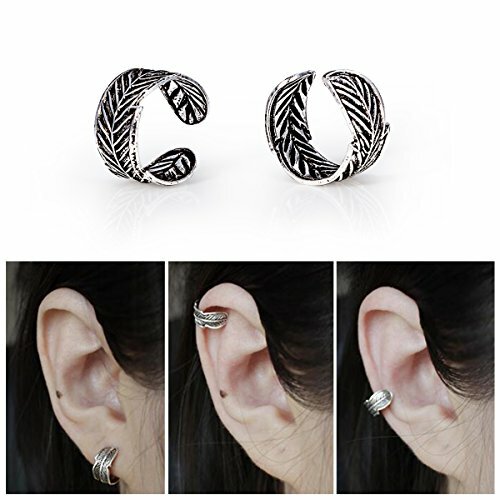 Made of 925 sterling silver, never mind allergies, best choice to protect your ear. This vintage carved leaf design is very cool, stylish and special. One size, suit for most people's ears. It's flexible so they conform to the ear, you can wear them up higher or lower on your cartilage. Easy to put on, easy to adjust, and comfortable to wear. What you will get: a pair of ear cuffs and a beautiful gift box. Best gift to your friends and family. If you have any questions about this product by Aifeer, contact us by completing and submitting the form below. If you are looking for a specif part number, please include it with your message.